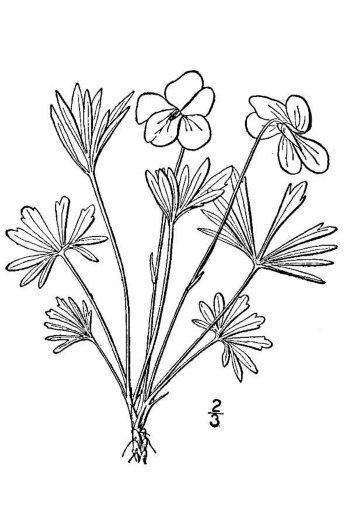 Foliage: Basal leaves, finely dissected; similar to that of Coastal violet, but leaf divisions are not as linear or regular in Coast Violet and the middle division is often broad and irregular. Flower: Purple, often with upper petals much darker, with orange stamens. Compare to Coastal violet, which does not have orange stamens, but a white throat. 1 - 1 1/2"
Flowering time: Flowers April through June. 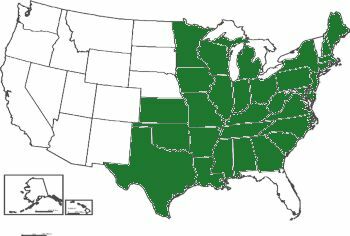 Range in New Jersey: Occasional through the northern counties, common in the Middle district and down the Coastal strip to Cape May; Stone notes apparently rare and introduced in the Pine Barrens. Stone (1911) notes that it occasionally has autumnal blooms as well. 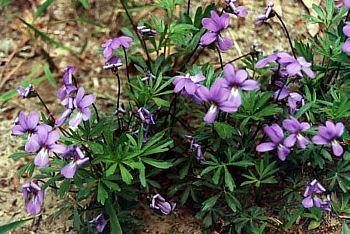 Viola, violet colored, and pedata, refers to bird-foot like leaves. One of our prettiest violets.